Join the Protest and Petition to Scrap the ICP contract. NHS England is consulting on the contract for a new model of health and social care provision that threatens the break-up of the NHS into units run by ‘Integrated Care Providers’ – or ‘ICPs’. Each of these ‘business units’ would control spending and rationing of healthcare for populations of up to 500,000 each. They will dis-integrate health and social care and put Finance before patient care. These huge contracts will be open to the private sector to compete for. They are therefore a serious threat to the NHS as a publicly owned and publicly run service. Keep Our NHS Public, Heath Campaigns Together, We Own It and #JR4NHS have called a joint protest to draw attention to the Governments plans to continue the privatisation of our NHS. 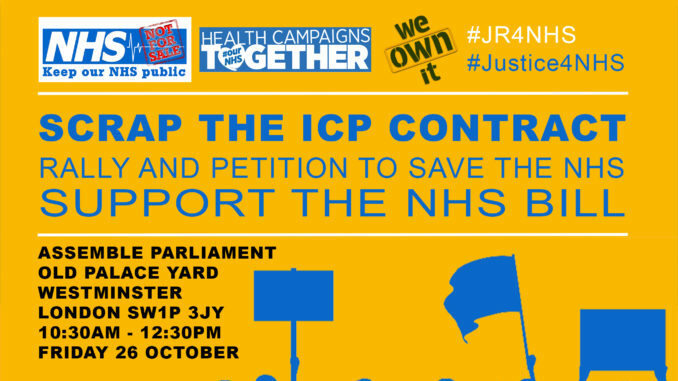 After we’ve assembled at Parliament we’ll be handing in our petition to scrap ICPs at the Department of Health and Social Care on Victoria St, (Westminster, London SW1H 0EU). Also on Friday the second reading of the NHS Bill is timetabled, though it may not get a reading. The NHS Bill is vital to safeguard against these attacks and must be supported. Please click let us know you’re coming via the Facebook Event and share as widely as possible.